The Selection filter in both the Receive and Invoice tabs will now default to Last 30 Days. Users can select other values from the Selection drop-down as needed, but the default will remain at Last 30 Days when the tab is accessed again. When creating a manual invoice, users will be prompted to create a regular invoice or credit memo if Credit Memo functionality is enabled. Credit memo amounts are entered as positive values. The credit memo document can be transmitted to the financial system to credit the appropriate accounts. Credit Memo functionality is not supported by all GL integrations. Please contact Customer Support if you would like additional information. As a part of ongoing maintenance, we’ve removed several fields from theReporter. Some of the fields were replaced by other enhancements, while others were not visible elsewhere in the application. 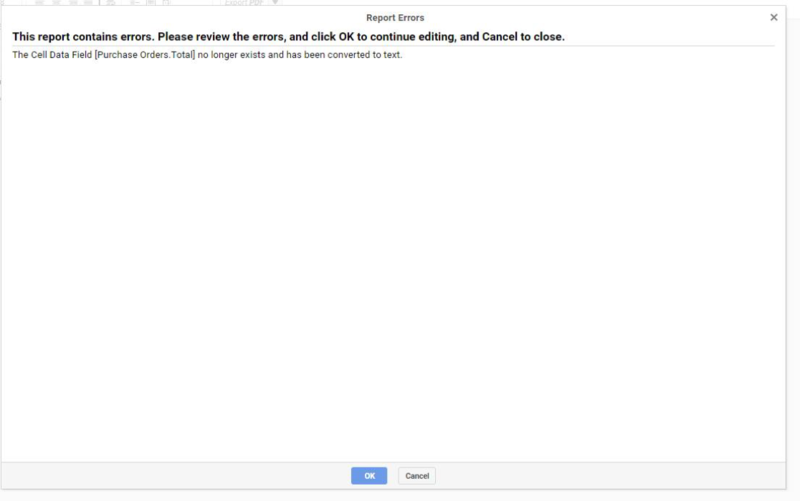 If a popup like the one below displays when generating a report, one of the listed fields needs to be removed from the report layout. When searching for a supplier for a walk-in response, inactive non-catalog suppliers from Purchase will display as part of the search results when relevant. A walk-in response can be created on behalf of an inactive supplier, but the response cannot receive an award unless the supplier record is marked active in Purchase. The search screen will also display all walk-in responses for the event: responses in progress as well as submitted responses. The user will be brought to the detail of the response after selecting the supplier.